Slice eggplant vertically and set cut-side up on a baking sheet. Score eggplant in a criss-cross pattern, then sprinkle cut side with 1/4 teaspoon salt. Let rest while you prepare the sauce, and preheat the grill for medium heat. Whisk together tahini, water, lemon juice, garlic, za'atar, and 1/4 teaspoon salt. Taste and adjust spices as needed. 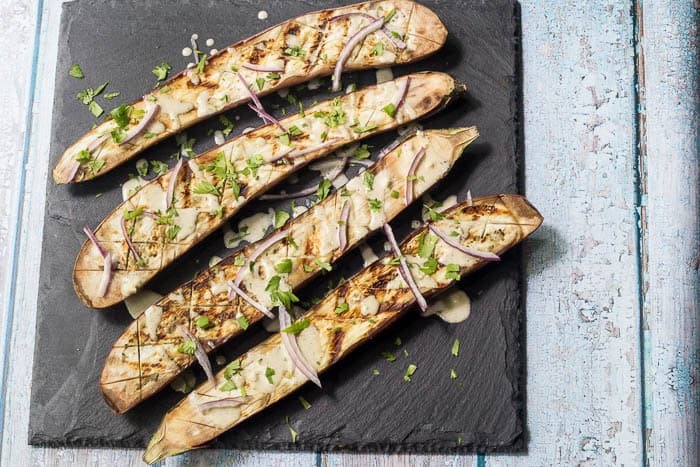 When the grill is ready, brush cut side of eggplant lightly with olive oil (too much will cause it to drip and your grill will flare up). Grill cut-side down for about 5 minutes, then turn over and grill on the skin side for about 2 minutes more. Serve with the prepared sauce, red onion, and cilantro scattered on top.